Tucked into the corner of the case was this interesting looking piece begging for attention, like the sad puppy in the pet shop window. I asked to see it. The grip felt good to me, like it was meant for my hand. The heft was less than the Ruger, but felt more substantial than the LC9. And the price was well over $100 less. To be fair, the LC9 does offer a manual safety and a magazine safety, so if those things are important to you then the Kel-Tec is not for you. I decided to buy one at the low – low price of $279 + Michigan sale’s tax. The wife bought one too (We have consecutive serial numbers!). 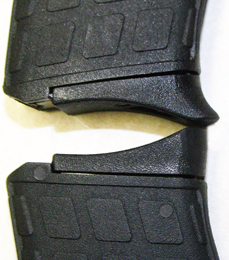 I carry my PF-9 in the small of my back in a compact IWB holster. The gun is thin enough that sometimes I panic that I have lost my gun because I don’t feel it back there. Because of my size (i.e. weight) I am not comfortable wearing my gun anywhere else inside my waistband, but I have gotten fairly good at being able to draw the Kel-Tec from the small of my back. 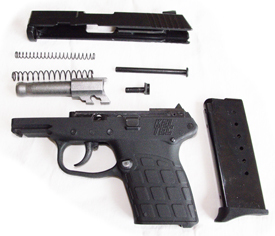 The gun tears down easily by locking the slide back and removing the assembly pin. From there everything comes apart easily for cleaning. At no time do you feel you need three hands to get it apart. Notable are the dual recoil springs that fit one inside the other. Putting it back together requires only a little more attention, and that third hand would come in handy to hold the barrel forward as you pull the slide back so that the assembly pin can be put back into place. Though I find the slide easy enough to rack, the wife has to really work at getting it to chamber a round, or lock open. On the average I think most will find this amount of recoil spring manageable. So how does it shoot? I was able to make successive double taps within a six inch circle at about 12 yards. My first day shooting I blasted through 250 rounds of ball ammo and had no misfires, stove pipes, or failure to go into battery. I tried to limp wrist the gun a bit to see if I could make it fail and it never did. We went though a box of 25 Hornady Critical Defense ammo without an issue. The wife didn’t shoot hers as much because the recoil did intimidate her a bit. Even so, she experienced no malfunctions as well. The Kel-Tecs when bang every time we pulled the trigger. So as I said, our first day out we shot and shot and shot, which lead me to my first complaint about the Kel-Tec. I developed a blister on the big knuckle of my thumb were the top of the grip rubbed. The continued recoil of the gun caused the gun to rub against my knuckle and slowly remove the skin from where it belonged. When I got home my solution was to take my X-Acto Knife and trim just a bit of material away from the upper left portion of the frame near the back of the grip and sand it smooth. By increasing the radius of the curve in this area I completely eliminated blistering my knuckle on future outings. 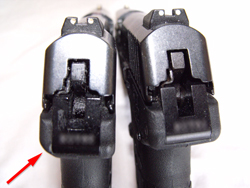 Kel-Tec is nice enough to include a magazine extension on their magazines, which the wife loves. I, however, have bigger hands, and found that the extension curved and dug right into the middle on my pinky finger. With X-Acto Knife in hand I trimmed the curve flat so that my pinky finger could lay down flush with my other fingers. A touch up with sandpaper and it looks like it came from the factory that way. Overall, I find the Kel-Tec PF-9 a very likeable, controllable, and good looking carry gun. It is not a gun that you take to the range for the joy of shooting. You take this gun to the range to PRACTICE. If you want to enjoy shooting, get a larger frame fun and fire away. The Kel-Tec is a small, lightweight 9mm that seems to eat any ammo you give it. To date we have put thousands of rounds down the barrel of our Kel-Tecs without an issue. I haven’t had this good of a track record with some of the more expensive guns I own. 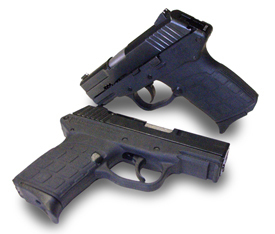 Smaller shooters, and those still not comfortable with things that go “bang” (and like to jump out of their hands) might find the PF-9 intimidating, but if you are aware that a small gun like this will not let you forget you’re shooting a gun, then you will not have a problem with the Kel-Tec. I would feel comfortable calling on the Kel-Tec to do it’s job if the need arises, which is way I trust it as my carry gun wherever I go.